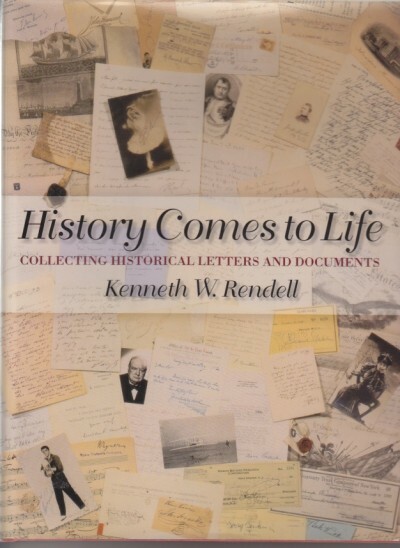 In History Comes to Life: Collected Historical Letters and Documents, Kenneth W. Rendell guides the reader through all aspects of collecting irresistible letters, manuscripts, and documents in virtually all subject areas from ancient times through the twentieth century. The book discusses the reasons why collectors acquire these tangible links to the people they admire; the material available on the market; the people who are attracted to the field; where manuscripts are to be found; the detection of forgeries; ways in which the value of documents is determined; and the care and preservation of collections. Rendell also provides a mass of information on the type, availability, and rarity of autograph material for more than one thousand prominent personalities in various subject areas - American history, including an in-depth coverage of presidential material; English, French, and other European political and military history, including World War II; music, art, literature, and the performing arts; and other areas, including science, business, exploration, religion, law, and sports. Kenneth W. Rendell is a dealer in historical letters and documents, with offices in Boston and a gallery on Madison Avenue in New York City. He is the author of History Comes to Life: Collecting Historical Letters and Documents and Forging History: The Detection of Fake Letters and Documents and With Weapons and Wits: Propaganda and Psychological Warfare in World War II. He is co-author of the award-winning Autographs and Manuscripts: A Collector's Manual. He resides in Boston, Massachusetts.